a few things to remember as we head into the holiday season. These tips will keep your body more balanced and your digestion strong as we head into the carb and sugar-overload that is the holiday season! Grab some greens before you dive into your meal || Make it a habit to grab a handful of greens before each meal. Not only will you be getting more greens into your overall diet (more fiber, more enzymes, more nutrients! ), you’ll also be filling up a bit before the meal so you’re likely to eat less overall. Eat some sauerkraut! || Anything pickled will do. If you’re not into that (it took me awhile to learn to like it! ), try a probiotic pill instead. The goal is to keep your gut and its flora healthy for better digestion. Drink water throughout the day || They say you should drink half your body weight in ounces of water. Make sure you’re doing this especially throughout the holiday season! It will keep you hydrated, keep things moving, and will also make you feel a bit more full. Start off the morning with some lemon-ginger tonic || Make a quick tea tonic each morning to kick-start your digestion. Juice some lemon and grate some ginger. Add some honey and some cayenne to taste. This helps aid your digestion and keep your blood sugar levels under control. (It’s also delicious! Pro-tip: if you drink this every day, make sure you drink with a straw to avoid the acid from the lemon eroding your teeth enamel). Opt for a breakfast smoothie || Another great way to get more fruits and veggies into your daily routine. Make sure you choose fruit lower in sugar (blueberries are a good choice!). You can also add avocado for some healthy fats. Add in some chia or flax seeds too! This will keep you full for the morning until you’re ready to grab some lunch (greens first!). Chew your food || We all know it’s easy to chow down on all of the delicious food at the dinner table. Make sure to take a breath and chew completely between each bite. This helps with digestion and your body will need to use less energy to digest. Take a walk || Make sure you’re exercising during the holidays to top it all off! Take a walk, do some yoga, or join your family in a fun game of catch. Anything will do. You just want to stay moving! I hope this helps! Do you have any routines you like to add into your day-to-day as the holidays approach? I’d love to hear your advice!! I definitely have a sweet tooth. I always have a bit of a chocolate craving, especially in the afternoons & evenings and have been playing with ways to satisfy my cravings without consuming too much chocolate. 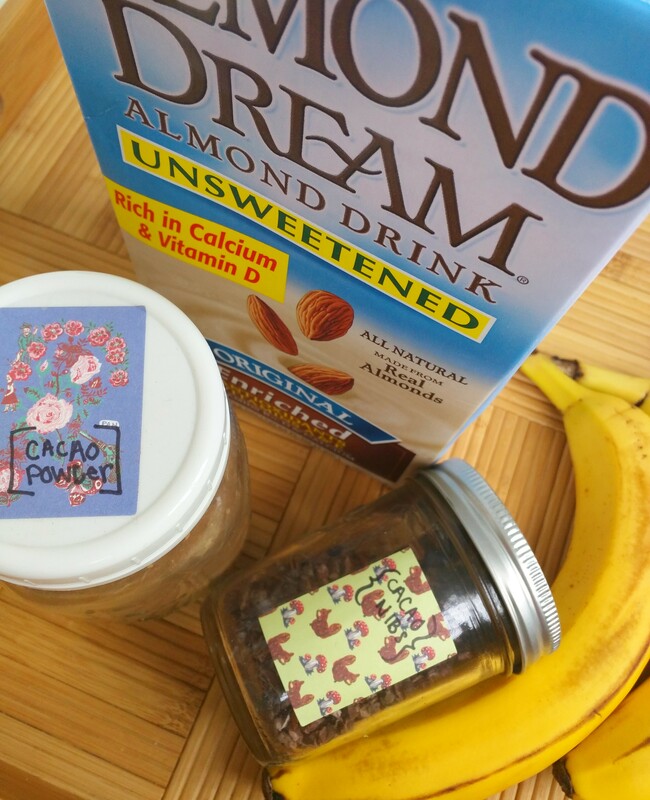 I came up with this delicious Cacao Banana Shake that is always exactly what I want when I’m craving a little something sweet. When you read headlines and articles about the amazing benefits of chocolate, they aren’t talking about milk chocolate you find in the store, but they are talking about raw cacao. Lucky for us, it’s just as (if not more) delicious, but sometimes does take a little getting used to! 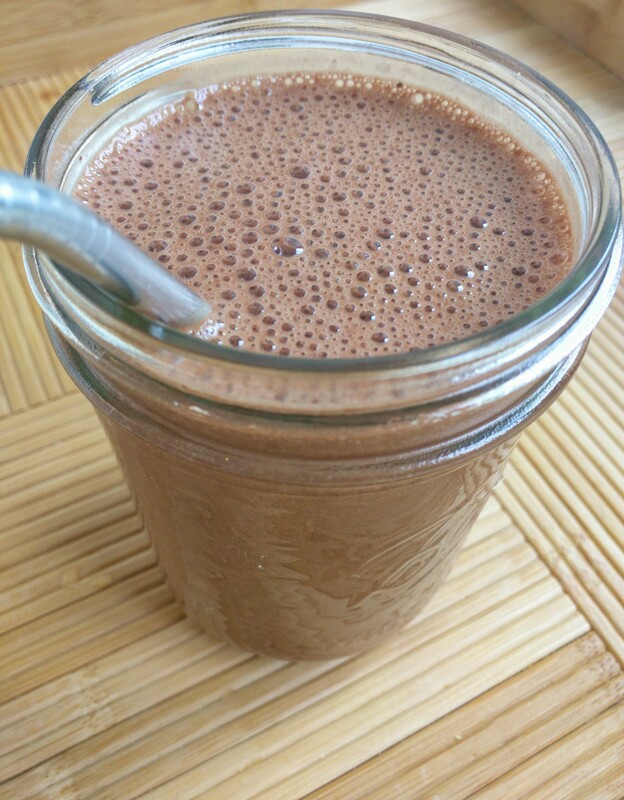 So what is raw cacao exactly? It is the powder that is made after un-roasted cacao beans are cold-pressed. Fat is removed (the butter) and living enzymes are kept intact. Cocoa is also a powder and looks very similar, but, boy, is it different! We get cocoa from roasting raw cacao at high temperatures, which changes the molecular structure, ultimately making it less nutritionally beneficial for us to consume. In other words, it is the over-processed version of cacao. So, what do you say? Let’s get to it! Pro-tip: You might find that some brands (cough, Hershey’s, cough), has a product labeled as 100% Cacao on the front, but if you look at the ingredients, you’ll see that it lists Cocoa, which is not the same thing as Cacao, as noted above. Be careful with tricky marketing designed to pull you in! 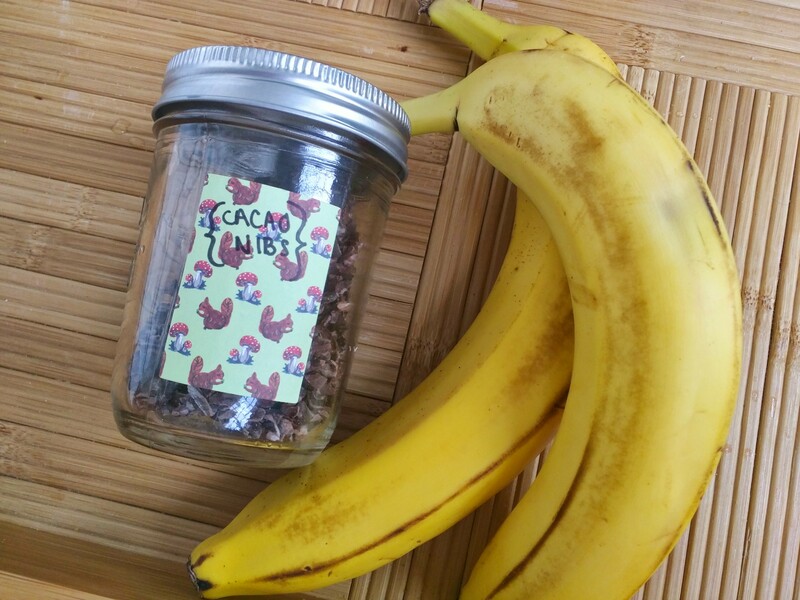 Pro-tip 2: I buy my Raw Cacao Powder (and Raw Cacao Nibs – see below) in bulk so I can get exactly the amount I need. And label them in pretty jars with fancy labels, of course. 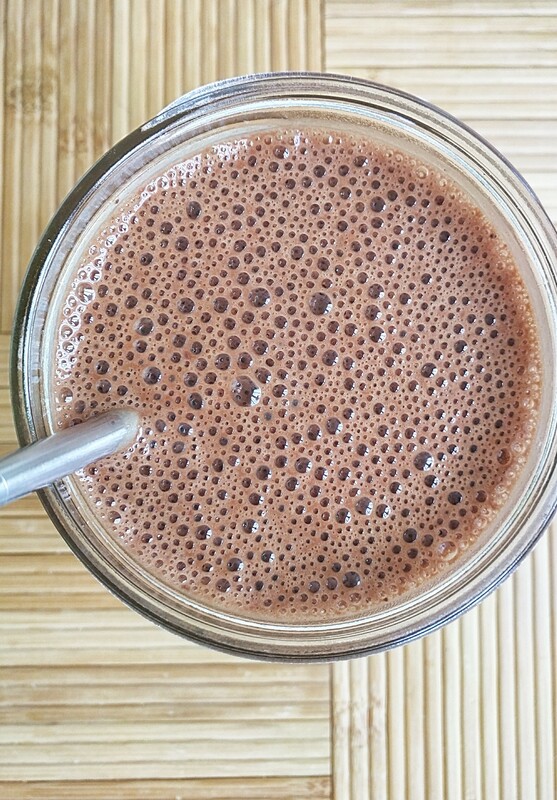 Superfood Powder or Protein Powder for extra power in your shake! 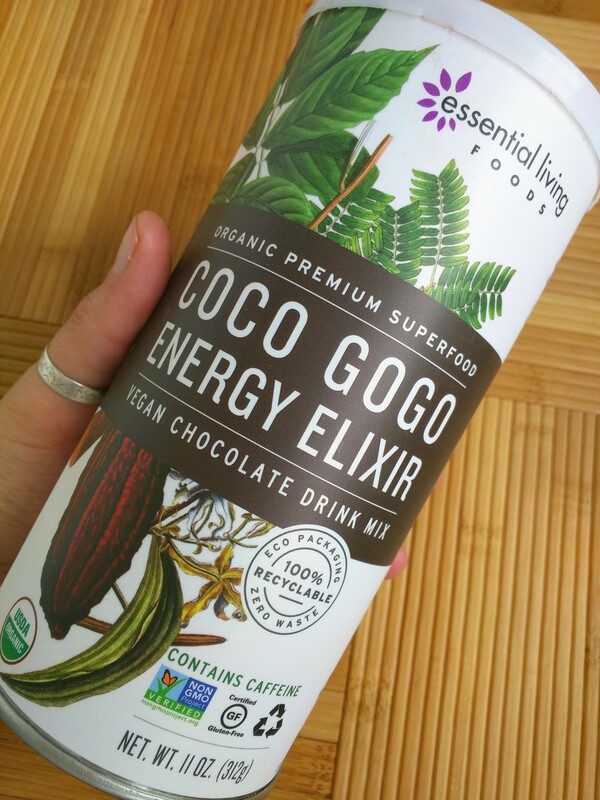 I really like Coco Mojo Energy Elixir by Essential Living Foods. I got mine on Thrive Market*. Pour into a fancy glass and let out a big sigh – it’s delicious! *Thrive Market is a neat online food marketplace whose mission is to make healthy living easy and affordable for everyone. You can get a free membership for ~30 days and then it costs ~$50 for the year. In exchange for your membership fees, they provide a membership to a family in need. You’ll find great deals on organic, raw, and delicious food and there are many unique finds! Note that these words are mine and not sponsored by Thrive, however the link is an affiliate linked to my account.